The bisquine is a typical boat of the region. She wears the largest rigging of all the traditional boats. Such boats practiced dredging of oysters in the bay of Mont Saint Michel, trawling, and for the largest, line fishing. The bisquines had totally disappeared, but enthusiasts have begun to revive in Cancale and Granville. The Cancalaise was built under the direction of Raymond Labbé from 1985 to 1987 according to the plans of the bisquine "La Perle" raised on the wreckage in 1958 by Jean Le Bot. 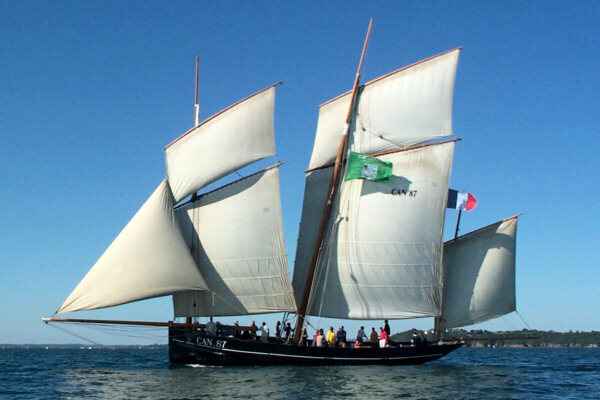 In season, if not in navigation, Cancalaise is normally at anchor in the cove of Port-Mer in the north of Cancale. In the winter she is desarmed in the Cancale Port.